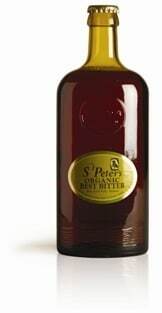 The bottle that your glass of St Peter’s beer comes in is a replica of one first produced in 1770 for Thomas Gerrard, an innkeeper in Gibbstown, near Philadelphia. There is little connection between Gerrard and the modern St Peter’s brewery in Suffolk, but the bottle is a lovely shape and has a satisfying quality to it, and the fact that it is modelled on something old and obscure betrays an attention to detail that’s very apparent in the beer itself. The suggestion is that because the bottle has been thought about and well-crafted, the beer must be good. There are many instances where this isn’t the case, where style triumphs over substance, and where the customer pays through the nose for the packaging, not the product. Starbucks, anybody? St Peter’s beers don’t fall into this category, and it’s great to see their quality beers so widely available. I’ve been buying the occasional four pack from the supermarket for a while now, and each of the beers I’ve sampled has been good – imaginative, well-made and robust. My favourite so far has been Cream Stout, a heady, bitter brew with a smooth feel and a deep chocolate colour. Best Bitter is excellent too – a superb, full, traditional bitter with a slightly bittersweet taste. Golden Ale, a lighter, European style brew is a huge success. The brewery’s core products are ‘traditional’ beers, supplemented with a range of seasonal and slightly unusual fruit and honey beers. There is a sense here of preserving old techniques and adding to them with a new twist. Ninety percent of St Peter’s output is bottled, so finding this on tap is likely to be near impossible, especially outside The Big Smoke. There’s one glimmer of hope for those who dare to travel to the capital…St Peter’s own a pub, the Jerusalem Tavern in Clerkenwell, which from what I can gather is a superb little place. It’s been in existence in some guise or another since the 14th century, so you’d expect that they’re doing something right. St Peter’s online store has a full range available, the mixed case (two each of six bottles) for £22 representing particularly good value. Right now, they’ve got a some bargain cases of Winter Ale, incorrectly labelled with American labels on the front and European labels on the back. At £16 a case, it’s a steal if you can cope with your beer coming in a mildly confusing bottle, which at that price, I really don’t. Modern classics in the making? Definitely. Photo from St Peter’s Brewery.